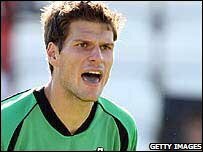 Portsmouth goalkeeper Asmir Begovic will link up with Yeovil Town later this week after some time off due to the death of his grandfather. Yeovil are trying to sort out a loan deal with Pompey after the Bosnian-born Canadian, 21, had a successful spell at Huish Park last season. Chief executive Martyn Starnes told BBC Points West that Begovic is expected to feature at Weymouth this weekend. "I expect him to play on Saturday. Then we'll see how things develop." Starnes also revealed that there could be further moves in and out of the club in the near future. "We're aware that Cheltenham have had Lloyd [Owusu] watched a couple of times in pre-season. "I guess every player has a potential value and if Cheltenham wish to make an offer then we'll obviously consider it. "We'll continue to look to see if we can bring someone in to strengthen the striking department."